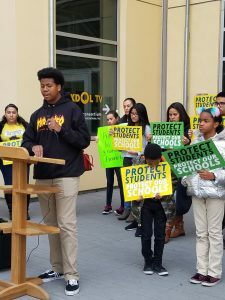 Last week, Californians for Justice staff and student leaders in Oakland organized our community to lift up their voice and call for district and education leaders to protect students and protect our schools! We hosted a joint press conference with Oakland Community Organizations and Public Advocates to show that our students and families are clear: We want to protect our school sites, support our teachers with higher wages, and ensure community voice is reflected in the tough decisions that lay ahead. For this reason we believe now is the time our district must rely on the wisdom and knowledge of those who are most impacted – our students and families. Over the last decade, young people and parents in our public schools have been the biggest advocates – organizing across their communities to demand the full investment of public schools. Youth and parent leaders fought to bring money into our schools passing Props 30, 55 and the Local Control Funding Formula. That’s why CFJ is committed to uplifting youth and community voice throughout this process to ensure we’re leading together for thoughtful, effective and realistic policies that will protect our students and schools. “Students and families can’t afford to lose more teachers. Teachers are our biggest support…[they] are doing this work knowing full well they have roles in our lives beyond teaching lessons. They are role models, they offer supports that we can’t always access at home, they support parents with raising us because they are a part of our everyday lives,” said Armon Mathews, senior at Oakland High and CFJ Student Leader. CFJ Student Leaders like Armon have been involved in district conversations on supports for teachers for more than a year and will continue speaking out and mobilizing others in the community. Many Oakland Unified students are organizing collective actions in solidarity with the planned teacher strike this month, proving once again that our youth are leading the way for transformation in our schools, communities and beyond. Donate. Donate to the Bread For Ed campaign or OEA’s GoFundMe to support need-based grants for teachers. Stay informed. Stay in touch with Californians for Justice and check out other community groups like Bay Area PLAN and Bay Resistance, for the latest updates on community actions and conversations. Get involved long-term. Sign up to get updates and join the conversations around the Schools and Communities First work as ramp up in the fight to ensure fully-funded schools in 2020.